A SpaceX Falcon Heavy rocket launches from Pad 39A of NASA's Kennedy Space Center on Feb. 6, 2018. It was the debut flight for the heavy-lift rocket. SpaceX's giant Falcon Heavy rocket could take to the skies five weeks from now, if everything goes according to plan. 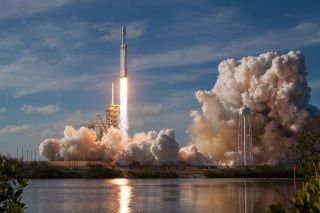 The California-based company is targeting March 7 for the Falcon Heavy's second-ever launch, Ars Technica reported, citing permit applications that SpaceX filed this week with the Federal Communications Commission. This schedule is far from firm, however; March 7 is a "no earlier than" date, which means the liftoff could easily get pushed to the right. The rocket will loft the 6.6-ton (6 metric tons) Arabsat 6A communications satellite for Saudi Arabia, a far more conventional payload than the Falcon Heavy toted on its first mission. That shakedown flight, which lifted off from Pad 39A in February 2018, sent a Tesla Roadster and its mannequin driver, dubbed Starman, into orbit around the sun. Like SpaceX's workhorse Falcon 9 rocket, the Falcon Heavy is a two-stage rocket with a reusable first stage. The Falcon Heavy's first stage consists of three Falcon 9 first stages: a modified central "core" and two side boosters. All three of these boosters are designed to land back on Earth and fly again. (The second stage is not reusable.) During the February 2018 mission, the two side boosters aced their touchdowns at Landing Zone 1, a SpaceX facility at Cape Canaveral Air Force Station, which is next door to KSC. The core booster tried to land at sea on a robotic SpaceX "drone ship" but came up just short. The Falcon Heavy is by far the most powerful rocket flying today. The launcher is capable of carrying about 70.5 tons (64 metric tons) to Earth orbit, according to the craft's SpaceX spec sheet.